Why is it that we almost step not just 10 feet away, but out the door and onto the side walk away, when we hear the word, “Kale”. It’s harder to give away than Collards or Swiss Chard, never understood that since I use it the same as I do the other ones. But I get it, new things are always a bit daunting. Here is a simple dish using Kale. Saute’ garlic and onion in a bit of olive oil on medium-high heat, don’t let it burn but get it a nice golden color. Add chicken after 4-5 minutes. Sprinkle with taco seasoning (I love to make my own using salt, pepper, paprika, cayenne (a pinch mind you! ), cumin, chili powder, and oregano. Cook until the chicken is almost done and add the kale. 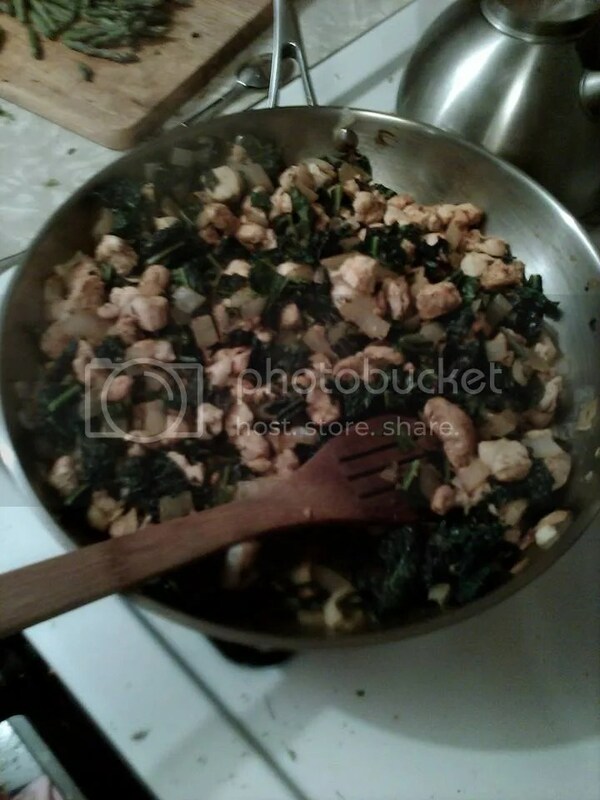 Kale can take a while to cook which is why I add it before the chicken is fully cooked. Tonight I served it with quinoa (don’t shudder!) asparagus, and small amount of refried beans because my kids have been eating like cows lately. I love kale!!!! I put it in my smoothies and salad all the time, and my kids love kale chips. (They’re weird).